A black and white photograph of an unidentified man and flight student standing in front of an Aeronca Champion plane (also known as a Champ) at Oshawa Airport. Underneath the wing of the airplane it says "DNO" - likely to be part of the plane registration number for CF-DNO that was operated by the Ontario County Flying Club, the predecessor of Oshawa Flying Club. 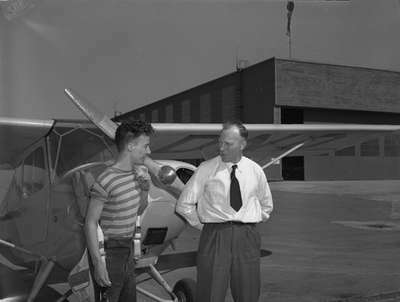 An unidentified man and flight student standing in front of Aeronca Champion, Date Unknown, Marjorie Ruddy. Whitby Archives A2013_040_1168.